Chloe’s older sister, Ruby, is the girl everyone looks to and longs for, who can’t be captured or caged. After a night with Ruby’s friends goes horribly wrong and Chloe discovers a dead body floating in the reservoir, Chloe is sent away—away from home, away from Ruby. But Ruby will do anything to get her sister back, and when Chloe returns home at last, she finds a precarious and deadly balance waiting for her. As Chloe flirts with the truth that Ruby has hidden deeply away, the fragile line between life and death is redrawn by the complex bonds of sisterhood. 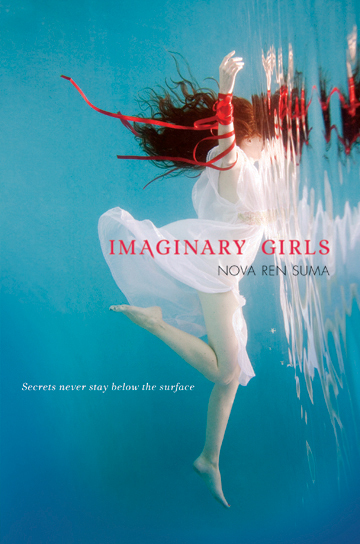 Imaginary Girls is a masterfully distorted vision of family with twists that beg for their secrets to be kept. I have been thinking a lot about what differentiates a book about a teenager/teenagers that's for teenagers and a book about a teenager/teenagers that's for adults. I'm reading Norwegian Wood at the moment (I am reading about ten different books at the moment - I go through phases of intensively reading everything and then reading hardly at all), and thinking about the fact that the characters are eighteen, nineteen, and having the experiences of people at that age, but trying to figure out what makes it a book for adults. I think it's the way in which the story is told, the perspective, the interpretation through the narrator. Even if a book is wholly about teenagers and the teenage experience, if it's being told through the eyes of an adult, twenty years on, and the events are processed as an adult would process them, then it's book for adults. I am not one hundred percent sure about this. I also recently read Never Let Me Go, and a lot of that is about when the characters are teenagers, but it's told from adult point-of-view. There's some degree of presentness to a YA novel, even if it's told in past tense. (Presentness should be a word but I don't think it is.) A YA novel is about someone in the midst of things, the story interpreted through teenage eyes. And this is related to the novel Imaginary Girls, in that despite it not being written from the perspective of an adult looking back on things, there is a certain degree to which the protagonist is removed from the story. I think it is perhaps the fantastical, magical, illusory aspects of it. It is very much about a bond between sisters (a twisted and bizarre and disturbing bond, but a very strong one), but it did not feel like a particularly teenaged novel - it is very literary for YA, and I think it is very much a crossover novel. Imaginary Girls reminded me in a way of Haruki Murakami's other novels - Norwegian Wood is really the least weird/most boring of them - in how splendidly surreal it was. I was also reminded of Margo Lanagan's stories (I've not read any of her novels, yet). Imaginary Girls is splendidly weird and beautifully written and full of very eerie scenes and strange relationships. I think it's very non-traditional for a YA novel, and maybe that'll disappoint people expecting a normal YA narrative (it's not big on fast-moving plot or standard YA romance). But it is terribly interesting, and I think it would engage older teenage readers and adults looking for a strange, surreal thriller-esque read. I did not find the characters particularly likeable, the weirdness and creepiness and slow build of the novel were brilliant, and the ending delightfully strange.